Salmon patties is a recipe asked for often in my family. This is the way my mother made them and I am carrying on the tradition. My twins love these salmon patties. I have to fix them whenever they come to visit me. It is one of their all time favorite meals. I have made salmon patties for years and my family won’t eat them any other way. The leftover patties are great for a sandwich on a bun with ketchup or mustard. Salmon patties will become one of your favorite recipes! Heat the oil in a large skillet. Combine the rest of the ingredients in a large mixing bowl. Using your hands mix the ingredients together and shape into patties. Place the patties in the hot oil and brown on each side. Turn the heat down and continue cooking on low for about 20 minutes turning often. Let cook until the patties are brown and crusty. Note: You can add onion, green pepper and some people roll theirs in cornmeal but the only way my family likes them is the recipe posted above. These salmon patties are great leftover and made into a sandwich with ketchup or serve them with my Country Fried Potatoes. Enjoy! I've been making these salmon patties for years and years. This is my mother's recipe and my family loves them. Heat the oil in a large skillet. Combine the rest of the ingredients in a large mixing bowl. Using your hands mix the ingredients together and shape into patties. Place the patties in the hot oil and brown on each side. Turn the heat down and continue cooking on low for about 20 minutes turning often. Let cook until the patties are brown and crusty. You can add onion, green pepper and some people roll theirs in cornmeal but the only way my family likes them is the recipe posted above. Don’t Forget to Pin Salmon Patties! 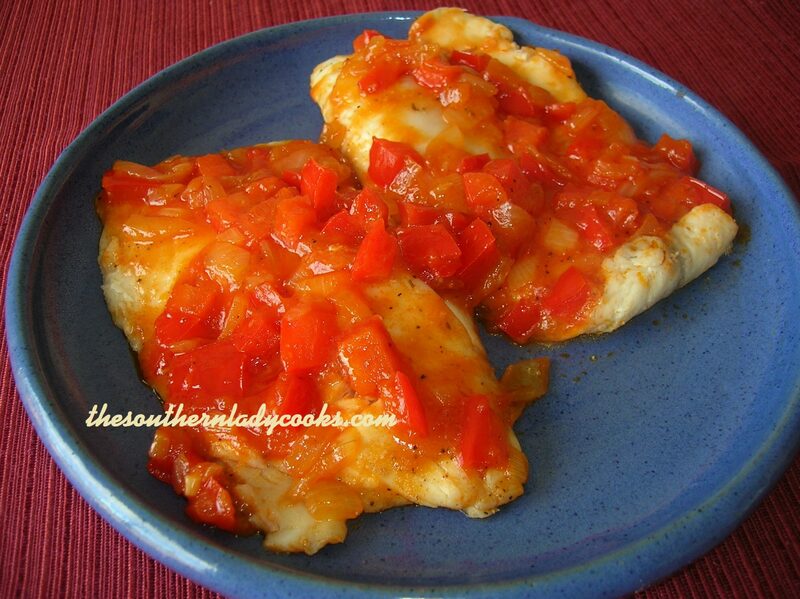 Just made this for dinner and it was a hit!served with coleslaw and cornbread it was very quick and easy. I used veggie ritz crackers and added Parmesan cheese flakes. Will definitely be making these again! So glad it was a hit! Your additions sound amazing. My mother would give me a little smacke on the back of my hand when I would pick out the bones and eat them right out of salmon as she was making the patties, they were made exactly like your recipe, I’m 70 years old they bring back wonderful memories with every bite. Thank you so much for your kind comment, David, and your wonderful rating. I have been making them like this for years and so did my mother before me. So happy to hear you are enjoying the recipes. I get about 6 to 8 patties depending on the size I make them. They have made the contents of the cans today so much less then they used to be that you can’t get as many. My sister and I ate the bones, too, and like your mother did you, we got scolded for it. The bones contain lots of calcium and are good for you. I don’t pick mine out but lots of people do before cooking. Have a great weekend and happy to have you as part of our community. My Dad’s family loved salmon…all you had to do is call some of my aunts or uncles and say “cooking salmon” they would come! We made it breakfast with biscuits light brown gravy ,eggs, fried potatoes ! Was a real special time with my family! Maybe would make with cornmeal ,others flour. Could be with crackers. Good whatever! What great memories! Thank you for sharing! Thank you, Sue. So happy to have you in our community and have a great week ahead. I use tuna also, using this recipe. My husband named them tuna pooties. 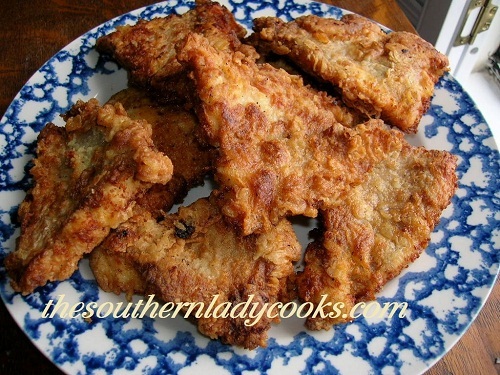 Southern Lady is the best recipe site. I use cornmeal instead of crackers, but otherwise the same recipe. Great taste. 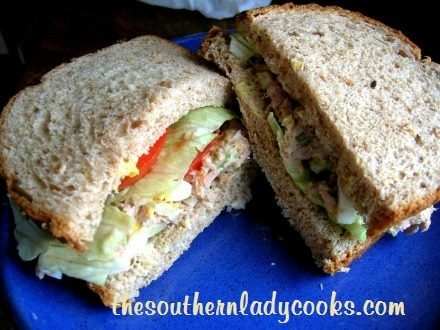 Brings back good memories, my Grandmothers,Mother and my Daddy would fix them and as we three children increased in age I had started cooking , it depended on who got home 1st we had the patties cooked biscuits done then my Daddy or Mother would fix tomato gravy if not we would fix cole slaw with biscuits! Makes me hungry now! I thought a roll sounded like too much also. I do mine by looks, maybe 10-15 crackers. Also roll them in a few crackers too. I have to have minced onions in it too. Love them, first thing my mom showed me how to make. We would have them with creamed corn and black-eyed peas. I’ve also lightly rolled mine in Panko crumbs. I also serve with creamed corn and either peas or green beans and sometimes lima beans. Love salmon patties but have to have onion in mine. Back in the 40’s and 50’s, when I was growing up, this was a staple to get us thru the month, along with salted cod. Inexpensive and very nutritious. Not inexpensive now and salted cod is almost impossible to find. Grew up on this same recipe. My mom served them with a side of real grits with black pepper and real butter…… so southern and so good….. now Im hungry. Never tried the biscuits with them but my mom always added onions. She would fry potatoes to go with them. This meal was always one of my favorites. I make them often and always take the bones and skin out. I chop carrot, celery and onion really finely, like in a food chopper and then add the eggs and crackers crumbs. I like them cold also. I forget to add them to my dinner food but then realize how much I like them. Enjoy! Some of us were talking about salmon patties just yesterday at the beauty shop and one of the ladies said the only time she uses her electric skillet is to fry salmon patties–on the back porch. My grandmother put just a dab of instant potatoes in her salmon mixture—–when instant potatoes hit the shelves years ago. Other than that, 3 generations have made them like this recipe. Occasionally, I will sprinkle a few dry minced onion flakes in–if I think about it. What wonderful memories. Thank you for sharing! Have a wonderful weekend. I was raised on salmon. My aunt and uncle were Alaskan fisherman. Every year they would bring my Mom several big salmon. She would can them in half pint jars and she would use them for salmon patties, salmon loafs, creamed salmon, sandwich spread etc. We love them cold too! My mom used to make salmon “croquettes”. I wasn’t a fan then. I have made them for my family since, as an adult, I decided I enjoyed the taste of salmon. I use one sleeve of saltines, one sleeve of Ritz crackers (usually generic), some dehydrated onion, two eggs, some Old Bay seasoning AND, I use one can of salmon and 2 5 oz. cans of Albacore tuna packed in water. They are a family favorite. Next time I make them, I’ll try them with salmon only. They are a treat! Love these! We add onion and finely chopped celery and dredge in cornmeal. My kids are grown now and still ask for them! 1. Glad to see the comment about reducing the “odor” with vinegar on the side. That has been my drawback to preparing salmon patties. 2. I like the idea of serving with tomato gravy. 3. Now, my idea on how to prepare: I remove the skin, but leave in the bones. The bones are easily located. Just crush them to a fine pulp, this is easy even with your fingeritips. The bones are where most of the nutrition is found in salmon. My mom always made these when I was growing up. When Salmon went up in price, someone told her tuna worked just as well. My dad hated tuna, so when she made these she would hide the tuna cans from him. He loved these, even told her to go back to the other brand of Salmon when she bought Salmon instead of tuna once!! It brings back lots of memories for me! These salmon patties are different from how I was raised on them but they are WAY better!!! I did add a few of the ingredients from our old recipe like diced onions & a splash of milk. I also use Paula Deen’s house seasoning to taste. My husband use to turn up his nose when I would make them the old way but now requests these quite often. They are amazing! We eat them with stewed tomatoes cooked with macaroni moods. YUM!! This is the way I learned from My Mother to make Salmon Patties (we called them Croquettes, as we made them in the shape of a triangle – still do). One of the first things I learned to cook, my Mother worked til 6:30, and I had to have dinner ready when she arrived home. Still make them the same way, my Son loves them, and makes them, too. We serve with Cole Slaw and a green veggie. Put Catsup, tartar or cocktail sauce on the ‘side’. Just as my GG taught me! Always with green peas and mashed potatoes as our sides! We love Salmon Patties but hate the fact the house smells like fish for a day or so. Any ideas how to avoid that? Have a bowl with white vinegar on the side. The vinegar will absorb the smell. Cheep and efficient. Plug in electric skillet outside and fry them there on back porch! No smelly house! Good idea Lu, I could do that. When I was young if my mom made these for breakfast I would pour syrup over mine, if she fixed em for supper I would put homemade tomato soup over em. This does bring back memories every time I fix em. My mother always picked the skin and bones out, but the only difference is she added onion to ours. That was the one meal she would make biscuits. We would have salmon patties, homemade biscuits with butter and real cane syrup, usually Blackburns or Eagle. DELICIOUS! Like a lot of other comments, this was one of our “poor man” meals. Thanks for sharing your recipe. I remove the bones after draining . I add onions, celery, eggs and bread crumbs and then fry the patties. My Mom made these (with a bit of onion) and 1/2 recipe of white sauce. She also used crushed Post Toasties (cereal) as the coating. Waaaay good! my mom would make these and then do creamed corn and pour that over the salmon patties. loved them……….i havent made them in years and without the creamed corn as my hubby hates anything creamed. This is how my late Mother made them, sometimes she added onion. But we NEVER had them without Tomato Gravy! I’m the only one in my family that likes them, I never make them just for myself. Mine are very similar , I add about a TBs. of ole yellow mustard. It adds a little kick. I usually cook then on my griddle that I have just barely oiled. Mac & cheese & vinegar based coleslaw were a meal we are often at home. The only thing my mom would do different is to put a light coating of flour on her patties. We were not “rich” growing up so mom would use the canned Mackrel instead of Salmon. We never new it was the cheaper version. Oh how I miss them! I always used Mackerel. My kids loved them. I added flour and onions also. Loved them!! The first time I made salmon patties (exactly like these) as a newlywed, my husband asked where the pancake syrup was. I was dumbfounded. lol I am from Oklahoma and had always eaten them all my life with ketchup. I thought he was joking. But he was serious. He grew up in Kansas and his mom always served them with syrup. I tried it and loved it! This is exactly how my mother made them, and they were delicious. Even though, as a child, I often helped her in the kitchen, and would make this myself, I didn’t try it as an adult for a long time. Then when I did, it really bothered me trying to get the bones out, so I didn’t do it again, until I found the cans of boneless salmon. I still use the boneless kind. I don’t think I could eat it knowing the bones were in there. LOL. This is how I make mine except I add just a little flour to help hold them together. We always have macaroni and cheese and blackeye peas with salmon patties. In fact, this is what I am making for supper tonight!! Please don’t remove the bones… if you must remove the skin okay.. but never remove the bones.. When I was pregnant and could not keep anything down (including my vitamins) my doctor had me eat salmon to make sure I got enough calcium. The bones are the best source of calcium you can find… Plus If you mix the salmon and fry it you should never see a bone. these are the best, my Mom had taught me how to make them just like this. The BOMB! They are great with macaroni and cheese and stewed tomatoes. This is the exact way l make mine. If I don’t have salmon, I use tuna. I also make a cheese sauce to put on them. Th I s is my families favorite. Can you use cracker crumbs or do you have to crush a sleeve of crackers? can they be baked instead of frying? Yes, they probably could but they won’t have the crunchy outside crust that frying gives them. I have baked them in the oven. I brush them with canola oil first on both sides. I also make sure I turn them over half way in between. I think you can bake them but, I use canola to fry them in and then put them on a paper towel and they are not real greasy either. I’m a good deal older than most of you and this, with the addition if a little onion, was my mom’s recipe. It was ‘broke’ food in our house. You know, the cheap thing to fix for dinner just before payday. Ours was served with fried potatoes and canned peas. I loved this meal and every time I fix it I think of my mom. I miss her everyday. Thanks for the post. I’ll be making salmon patties again soon. This is the same meal my Mom had when I was growing up. Usually creamed peas though. I even like them cold the next day. I just lost my moma and it make me smile to see these. I made them for her and she loved them. I put onion in mine too. Sorry for the loss of your Mom. Makes some Salmon patties and think of your Mom. God bless. That is just how I make them except l add onion. And flour them. Good cold the next morning for breakfast or anytime. I don’t use recipes, per se, but what I learned from my mother is to use salt cod, soaked over night in fresh water, then rinsed a couple of times. (I put it on to soak before going to bed then replace the water and let it soak all day, then rinse a time or two as I prep it. I break the fish up into flakes and rinse on last time them combine with eqaul volume of mashed potatoes (reserved left-overs or made new and cooled enough to handle). Form into patties, salt and pepper to taste, and place carefully in pretty-hot (not smoking) oil (I use olive) or bacon fat. Cook undisturbed until browned, flip, brown again, and serve. I use oatmeal instead of crackers same taste as crackers. Sharon – how much oatmeal do you use? I just had salmon patties last night for dinner! I mix in a little more to mine, seasoned salt, black pepper, a little red pepper, a little garlic powder, lemon juice and a little ketchup and yellow mustard. They were great. Served them with hashbrowns and baked beans. Glad to see all these people still enjoying them too! Yes, yes. My mouth is watering. Your recipe is similar to mine. These can also be frozen. I make them the same way but add a little onion, serve with soup beans, fried potatoes and cornbread….. I love soup beans, haven’t heard them called that since my Mom passed. Love me some Salmon patties too!!!!! This is exactly how I make them as well! Also an substitute canned tuna if you don’t have salmon on hand and they are just as good. I love your web site ! Like I make them except usually the filler is day old bread soaked in a little milk and the juice from the salmon. I have used saltines and it turns out almost the same. We like Stewed tomatoes over rice and collard greens with ours. They are also good with grits! Grew up on this recipe. When grocery money was tight we used the cans of mackerel instead. Add home made biscuits, pork n beans or, in the summer home grown boiled little potatoes, big slices of tomatoes, and green onions. I have always made them exactly the same way! And we are even worse as we have to have peas and mashed potatoes with them. Creamed peas preferably! Yum! Good evening, I made your salmon recipe last night and it was very good. I love salmon and biscuits with a touch of mustard, yummy! Thank you for another way of fixin’ these yummy creations! I love my Southern cooking, and love to find one of my family’s recipes on here!!! Been making these just like my Mama did when I was growing up, for oh about 50 years!!! And yes, they make a terrific sandwich the next day!!! This is the exact way I make Salmon Patties my mother did as well as her mother,we think they are the best! I like them as you posted, I serve them with Roulade sauce. Salmon patties are a great thing to serve I make corn fritters with mine and fried potatoes, some times bake beans with extra brown sugar in them. I also have mixed a can of mackerel and salmon togeather. for a filler. also make good ole mac and cheese for a side dish.i live here in the cold country ( MICHIGAN ). TEMP RIGHT NOW IS -4. I’ve tried many of your recipes and have loved each one!! Thanks for sharing!! Happy New Year, Sherry. So happy you are enjoying salmon again. Back when canned salmon was cheap, this was ‘broke food’ in our household often served just before payday. It was served with mashed potatoes, peas and salad. It was then and is now one of my favorite meals. With the addition of a little finely chopped onion, this is the recipe that my mom used. My grandma made the best salmon patties ever, but unfortunately I don’t know what all she put in them. I make mine the same way as your recipe except I add a little onion, lemon juice, and dill. I love your site…I am a southern girl all the way and the recipes on your site are what I grew up on. Thank you so much for taking the time to share with us. Nothing better than these with some Mac & cheese . Made them this way for years. So good. I’m from Lexington KY too, I add a little mayonnaise. I tried it as an experiment, and it was good! Yes my Mother made both Salmon patties and Loaf. She made a dill sauce for patties and served creamed peas with the loaf. Yummy good! and by the way I forgot to say I love your site, it is food and ingredients and terms I grew up on !!! My mama made salmon patties all the time …we loved them …seems just like your recipe !!! In high school, my best friends mom would makes these for us all the time! Several years have passed now and forgot about them until now! I made these tonight and my husband has requested to have these on our weekly menu! So delicious and just they way I remember them! This is the way my Mom always made them! No one else I know makes them this way. Glad to see I’m not alone! We use rolled oats instead of cracker crumbs. tuna works, you can also use half tuna and half salmon. instead of crackers we have always used hushpuppy mix 🙂 nothin better than salmon patties, pintos beans and fried cornbread! ON A COLD WINTER’S NIGHT WE ALWAYS LIKED TO HAVE THEM WITH SYRUP AND BISCUITS. SOOOO GOOD!!!!! I drain the salmon, remove bones, and use fat free crackers. I also add a small chopped onion. Thanks! I’ll give that a try. I keep thinking she added diced pickles or relish as well. I never pick through the salmon. It’s all digestible and can’t hurt you. Actually, I do sometimes pick the dark part and nibble on it while making the cakes. Hi Crystal and welcome to the site. I used to pick them out, too. I read somewhere that they are full of calcium and really good for you. I don’t pick them out any more and you cannot tell they are there when you add the crackers and egg. I have never had anyone say anything about them being in the salmon. Hope you enjoy the recipes and thank you for being a part of the site. Have a great day. You don’t have to pick the bones out. They have been pressured and they are great to eat and good for you. this is exactly how I make mine. Sometimes, I’ll add a can of tuna fish to make it go a little farther. we love salmon patties and this is how I make mine. I serve macaroni and tomatoes with mine. Oh so good!!!!! To get my son to eat salmon patties. I call them CRABBY PATTIES. (Sponge Bob food). I also like to add some Cajon seasoning to mine, just to spice things up a little. I first learned to make salmon patties this way when I worked for my uncle in a local restaurant in Mayfield, KY and this is exactly how they made them! They served them with some sweet pepper relish on the side and they always ran out early in the evening. These are some of my kids favorite things to eat and I try to make them when they come for a visit now… The menu usually consists of fried taters and homemade biscuits and gravy to go with them! Reading this brought back wonderful memories of my uncle and of my kids when they were little! I love your site!! Thank you so much for your wonderful comment. My kids love these salmon patties, too. You menu sounds a lot like mine. From one Ky. girl to another, I am so happy to have you here and hope you drop by often. So nice to meet another Kentuckian always. I love, love, love these!! I wish I had some right now! I haven’t made salmon patties in years, Judy, but I think I might try your recipe today. Your patties look exactly like the ones my Daddy used to make. He didn’t cook much, but he had a couple of “specialties.” And salmon patties were one of those. They were really, really good. Thanks for another wonderful recipe!